For the past few weeks here on FoodTruckr, the “How to Run a Food Truck” series has focused on helping you become a better business owner. So far, we’ve been looking at topics that relate directly to improving your food truck’s performance (monitoring industry trends, tracking your truck’s metrics, and preparing for health inspections). Today, however, we want to move on to a more personal aspect of your business: you! If your business is doing well, you’re working hard, and you’re happy because you’re getting to live the food truck dream every day, you might wonder what you could possibly need to do to improve your personal life. Well, if you’re really doing all three of the things we just mentioned and you’re still a brand new FoodTruckr, we’re willing to bet that you’re probably not taking as much time off as you could—or should. We know, we know—you just took a night off last week! And your truck wouldn’t be as successful as it is today if you weren’t out there every day hitting the streets from 10AM-9PM! Starting and running a food truck undoubtedly requires lots of long hours to be successful, but there comes a point when it’s more valuable for your business for you to take some time off than to keep on pushing. In today’s new lesson, we’ll explain why a healthy work/life balance is so important and help you find your own sweet spot between business and personal pursuits. Let’s get started by examining how taking time off (and how failing to do so!) can affect your work. Why Do I Need to Take Time Off? It’s easy for professionals in any field to get burnt out from working long hours and trying to keep up with all of their personal responsibilities at home, but balancing work and life is especially challenging for entrepreneurs who often feel pressured to spend all of their waking hours improving their businesses. And as a food truck owner, there’s always a long list of new things you could be working on to better your truck (New social media strategies! Improving your recipes! Analyzing your progress!). Though we advise spending some time outside of your service hours every week working on these things, it’s essential to keep your time spent on the business restricted to specific allotted times. It can be tough to shut off the work switch when there’s still a thousand things you could be doing, but there comes a point when you have to make yourself close the books, step away from your computer, and go do something unrelated to your food truck. Here’s why: Even if you’re not feeling exhausted by your work, chances are good that you’re not your most productive and effective self when you’re working your ninth day in a row without ever having taken some substantial time off. It’s good to love your work so much that you don’t want to disengage from it (and in fact, a passion for your craft is one of the best reasons to start a food truck in the first place!). However, there are undoubtedly tasks you have to complete in an average day that aren’t refreshing or rejuvenating you (answering emails, scrubbing your grills clean, driving around and around looking for a parking spot), and it’s important to give yourself time off every so often in order to ward off the effects of cumulative stress buildup from tiny, mundane tasks! We know that taking time off can sometimes feel like time wasted when you’re passionate about your business and completely committed to making your truck as successful as it can be. But just as your famous steaks need to marinate overnight in order to reach their fullest, juiciest, most flavorful potential, you need to occasionally give yourself a little time away from work if you want to come back feeling more energized and pumped to take your city by storm than ever before. Of course, it’s one thing to promise yourself you’ll start taking more time away from work—and it’s another thing to actually make it happen. We know firsthand how hard it can be for entrepreneurs to make themselves sit down and relax, so we’ve developed a simple list of five things you can do to improve your work/life balance. The first step to relaxing is deceptively challenging—you need to take regular time off from your food truck. A regular day off sounds fairly easy until you stop to think about where you’re going to find the time in your schedule—and what you might have to cut out in order to make it happen. Fortunately, some of the following steps will help you work more effectively when you are at work so that it becomes easier to find time to get away. You can choose a regular time off now, or you can wait until you’ve completed some of the upcoming steps and figured out where you’ll be getting your extra time. You can also choose any amount or combination of time off that feels right to you—two full days, a full day and several nights off, taking mornings off and only working from 1PM on. The specific time you take off doesn’t matter so much as the fact that you’re taking some time off, so don’t feel pressured to fit your working hours into a standard 9-5 schedule if another option works better for you and your truck. Note: Regardless of which option you choose, we recommend selecting a consistent time that you’ll take off and hold sacred each week. There will always be exceptions to the rule (for instance, an awesome festival taking place on your normal Saturday off or a big catering opportunity on your regular scheduled Wednesday vacation), but for the most part, you should try to stick to your scheduled time off. If you do need to work during your regularly scheduled time off, be sure to reschedule another time for yourself during the same week. Once you’ve established that you’re going to take some time off each week, it’s time to start figuring out where you’re going to find that extra time. The first thing you need to do is prioritize your current workload and eliminate distractions (Note: For the purposes of this lesson, “distractions” are things that you don’t really need to do, such as checking your email 30 times a day, or things that you don’t like doing and can outsource to someone else, such as updating your social media pages). Start out by making a list of everything you do in an average day and average week. Then, go through your list and assign your tasks two separate rankings—first, how important it is for each task to get done and, and second, how important it is for you to personally complete the task. Review the first set of rankings and see how many tasks at the bottom of the list could simply be eliminated completely. Is there an item on your menu that requires a disproportionate amount of prep work compared to how many people are actually buying it? It might be time to give it the axe. What about the time you’re spending on your Facebook, Twitter, Instagram, and Google+ pages—is there a platform or two that’s not bringing in much traffic that you could eliminate from your daily updating routine? Next, review the items at the bottom of the second set of rankings—the tasks that don’t necessarily need to be completed by you. Unless you truly love completing any of these tasks, it’s time to outsource them to one of your employees or to a professional whose cost is worth the extra time you’ll get back in your schedule. If you feel a little reluctant to pay someone to do something that you could do yourself, think of it this way: What could you be doing instead with the hours and hours you’re wasting on this task every month and every year? Sure, you could continue to be your own one-person marketing team and chef extraordinaire, but what could you achieve if you focused on the cooking and serving and instead let a professional help you reach out to customers? Chances are good that you could use those extra hours to strategize and accomplish more long-term goals for your business—and that you would likely even get more customers coming to your window with a marketing professional on your side. Similarly, you can also eliminate small, everyday distractions by automating tasks from your to-do list. This step covers categories of all kinds, ranging from paying your personal student loan and credit card bills to updating your truck’s daily location. If there’s something that you can automate so that you don’t have to think about it anymore, then you probably should. Use Amazon Subscribe & Save to have essentials for your truck delivered automatically. Use a food truck location app to automatically tell fans where you’re heading next. Sign up for the FoodTruckr email list (form located about halfway down this page) to get a free e-book with six social media tools you can use to better manage your Facebook and Twitter pages. Develop a system to track your food truck’s metrics. Set up Google News Alerts or follow FoodTruckr on Facebook or Twitter to stay up-to-date with the latest things happening in the industry. Use a POS system to track your sales, manage a customer loyalty program, and more. Finally, be sure to check out Lesson 4 from the “How to Run a Food Truck” series—titled “Use Apps to Simplify Your Business,” this lesson includes a whole range of apps you can use to make everything from tracking your inventory to communicating with your team a whole lot easier. Now that you’ve pared down your daily and weekly to-do lists, it’s time to focus in on the most effective ways to accomplish everything that you still need to get done. There are a number of ways to create a logical and sustainable schedule for yourself, but the approach we’d like to advocate today is to create a daily routine. Having a daily routine in place can help you to stay focused on your work when it’s time to actually work and can also make it easier for you to flip the “off” switch when it’s time to relax and embark upon your own personal time. Take a few minutes each morning to set a goal or intention for the day. What do you want to accomplish? How will you measure your success? Schedule things that are easy to forget into particular time slots. For example, if you have trouble remembering to update your sales records each day, make it the very last thing you do before you go home. It’s easier to remember tasks like this when they take place at the same time each day than when you simply make it a part of your daily closing routine. Include time every day to do something you really enjoy. Whether it’s eating dinner with your family, spending some time playing video games before bed, or taking an hour to head to the gym before you eat breakfast, it’s essential to give yourself a small bit of respite to do something that’s just for you every day. At the end of the day (either when you’re finished working or before you go to bed), reflect on what you achieved. Did you accomplish the goal or intention you set in the morning? If not, what can you do differently tomorrow to make things better? After you’ve reviewed your day, create a schedule for the next day and list any important things that need to be accomplished. It will be much easier to set tomorrow’s daily goal in the morning when you’ve given yourself a head start by outlining your schedule tonight. Finally, once you’ve started to get yourself into the habit of taking time off from work and eliminating things that distract you from being your most productive self, it’s essential to set boundaries and make sure that both you and the people around you respect them. If you don’t show other people that you’re serious about keeping your work time and your life time separate from one another, you’ll quickly find that that everyone around you will be trying to intrude during times when, frankly, they aren’t welcome. That’s not to say that employees calling you on your day off or family members who think they can hang out in the back of your truck while you’re working mean you any harm—they simply don’t realize the importance of work/life balance and of keeping your work time and personal time separate. Just as you’ll have to train yourself to take time off from work (and trust us, you will have to train yourself to stick to this! ), you also need to train the people around you to respect your separate work and life times. Let your employees know that they are only to call you on your day off if there’s an emergency. If they call you when you’re off and it’s not an emergency, kindly remind them of your policy and let them know that you’ll answer their questions when you return to work. The same thing goes for your family and friends—they should only be calling you when you’re working if there’s an emergency, not to simply catch up and shoot the breeze. When your best friend calls and wants to talk about plans for the weekend, let him or her know that you’ll call back as soon as you’re closed for the day. Don’t be afraid to say “no.” Many entrepreneurs also have a hard time saying no to the people around them because they truly believe they can accomplish everything. It’s important to accept early on in your career that you can’t—and that the more things you have on your plate at one time, the harder it will be to do any of them really well. Say “no” to opportunities that don’t really interest you from the beginning, and you’ll have an easier time sticking to your schedule and finding time for yourself away from work. Getting yourself to step away from work just to relax can definitely feel a little unnatural at first—but when you really begin to prioritize your time off, you’ll quickly see how much of a difference it can make on your overall productivity and energy when you return. Building time into your schedule regularly to relax is one of the best things you can do for yourself and your business. You’ll come back to your truck feeling restored and excited to begin tackling new things. How much time do you take off from your truck? What tools have you found to free up more time in your schedule? 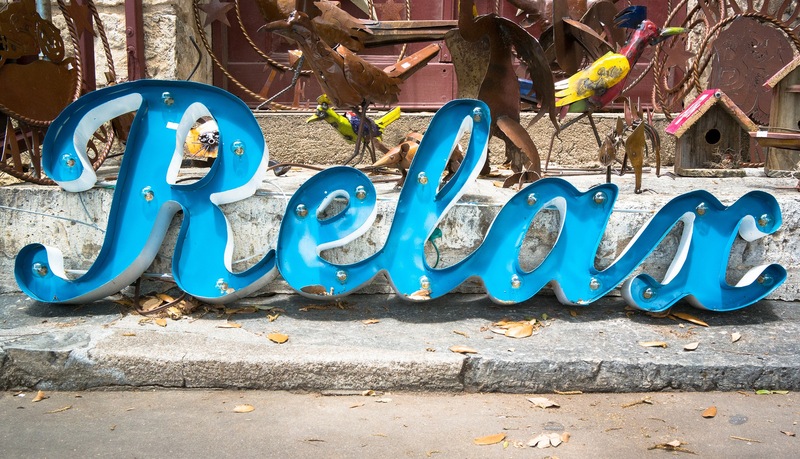 And, of course, what’s your favorite way to relax? We’d love to know what you’re doing to achieve a healthy work/life balance for yourself, so leave us a comment below or reach out on our Facebook or Twitter pages! Coming up next: In next week’s lesson, we’ll wrap up Unit 4 with a final lesson on improving yourself and your food truck business. Lesson 18 is all about consistency—what it means, and most importantly, how you can use it to develop a loyal fanbase. Stay tuned!